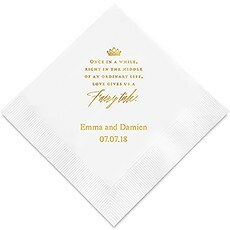 Our themed napkins are a great way to imprint your unique personality (literally!) 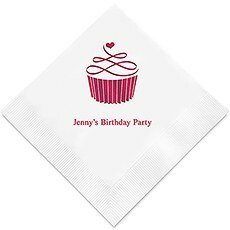 onto your engagement party, bridal shower, wedding reception, anniversary party and other special occasions. These premium customized paper napkins add a considerable amount of class for not a lot of cash. 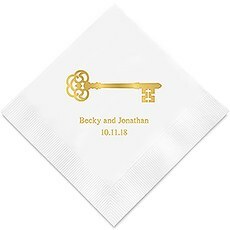 Choose a theme that best matches your personality and interests, and your guests will enjoy the personal touch. 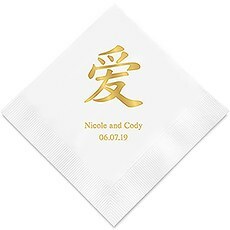 They might even want to bring it home with them as a special memento! 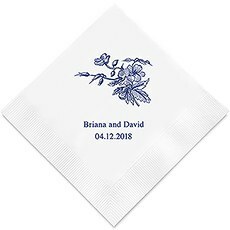 Here are our most popular theme designs for our personalized napkins.Is the happy couple a couple of cowboys? 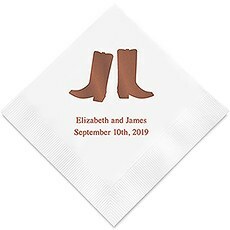 If so, choose our whimsical western boots design. 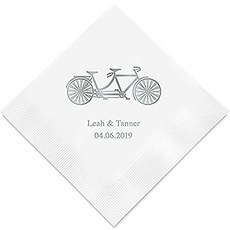 There's a bicycle built for two for fitness enthusiasts and an anchor for boat lovers-both of these are charming metaphors for settling down and starting a new life together. 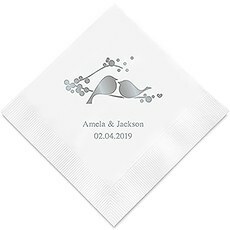 There are romantic designs, such as a pair of lovebirds, Once Upon a Dream and Love Gives Us a Fairytale. 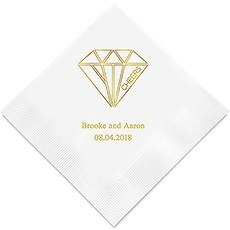 We have a whimsical feather design and a large diamond with the word "cheers," which is great for an engagement party. Other fun designs include Two Less Fish in the Sea, love antlers, Fore Love (for golfers) and The Adventure Begins, with a vintage travel compass.In our popular designs, you'll also discover logos that are appropriate for bachelorette parties, bridal showers, birthday parties, holiday parties and anniversary celebrations. 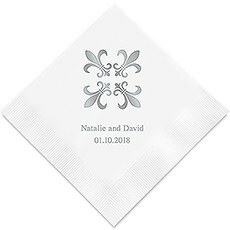 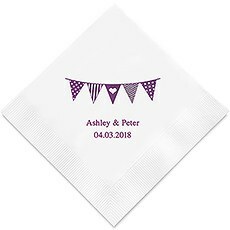 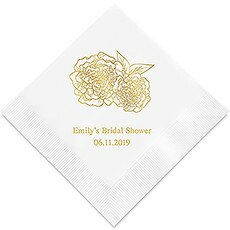 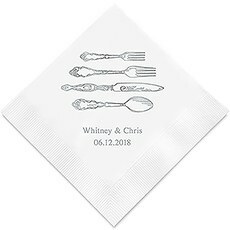 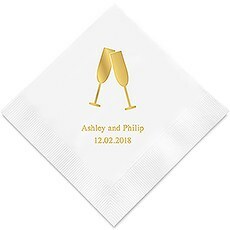 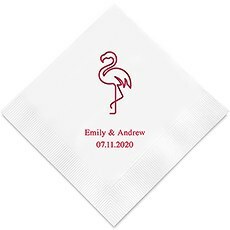 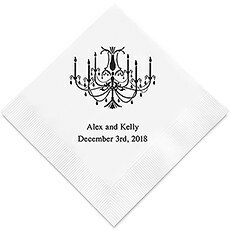 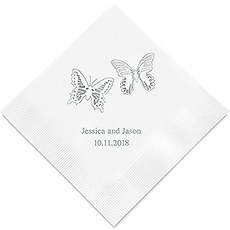 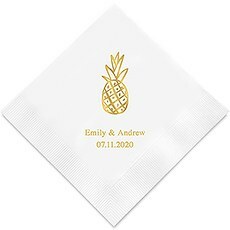 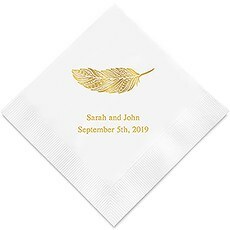 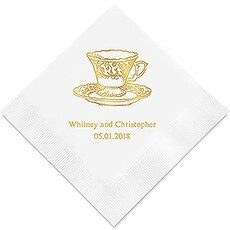 These popular personalized napkins are available in cocktail, luncheon and dinner sizes, with your choice of napkin color, imprint foil color and up to two additional lines of text. 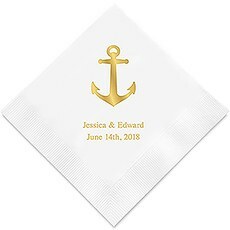 The foil imprinting is vibrant and really stands out for a beautiful touch to your reception or party decor.Weddingstar Inc., home of The Knot Shop, has been creating beautiful decor for traditional and contemporary weddings and other special occasions for more than 34 years.